After a long hibernation, I finally fire up the codebase for Alpha Juno Control and couldn’t believe the first version was released back in 2003. It’s difficult to estimate how many Alpha Juno’s (or MKS-50’s) have survived since they were released sometime in the mid 1980’s, but based on the amount of emails I receive saying “Can you update AJC to support MacOS 10.x?”, there must be a fair amount. I’m still an avid user of my beloved Alpha Juno and it’s apparent that there are many folks out there like me. 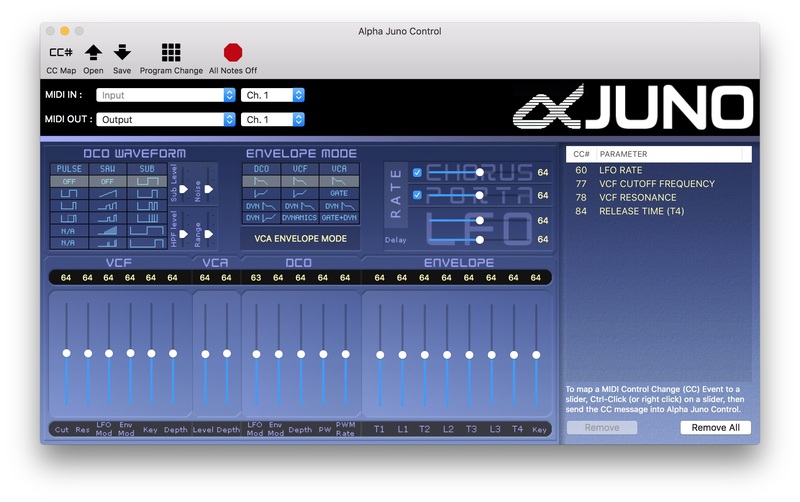 I deliberated updating AJC and putting it in the Mac App Store and charging a nominal fee, but in the end, I’ve decided to continue to offer it for free. Note: While I make my best effort to have bug-free releases, the reality is that sometimes a bug or crash might slip through, please feel free to comment below if you find any defects.